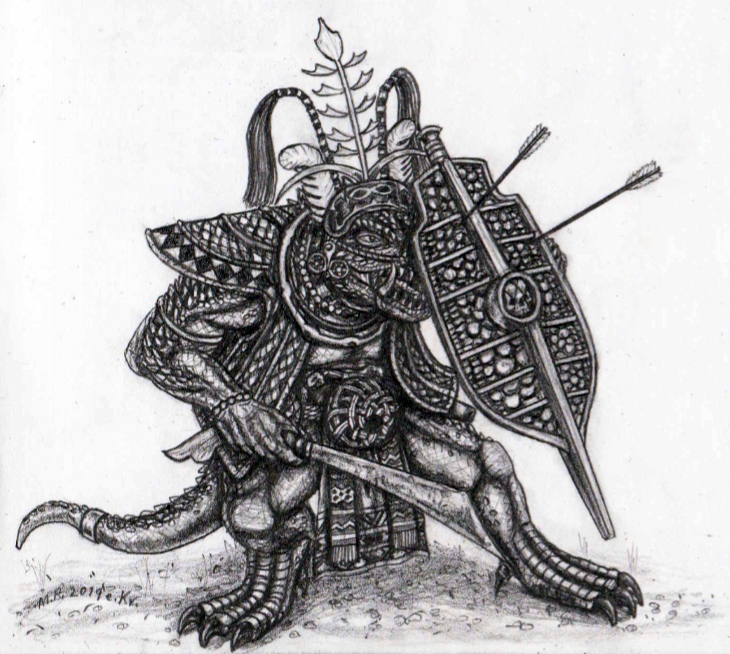 The Ninth Age (T9A) concept art for fantasy Indonesian Saurian armed with copper klewang, based upon Nias warrior garb. The Nias tribe were famous headhunters and warriors who carved wooden figures and small stone monuments for their houses. Saurian inspired by the sterling sculpting work of Rikard. The Saurian Ancients are Reptile peoples of the equatorial tropics who once ruled the entire world during the long First Age, yet their dominion was rent asunder by a giant comet followed by massive slave rebellions. The ascendant thralls of many different species went their own ways and founded civilizations and nomad hordes whose turbulent development have dominated all subsequent eight Ages. The Saurian Ancients are still great regional powers to be feared, however, for theirs is the pulsating might and olden glory of rich resources, and their claws and fangs are sharp even against foes bedecked in steel. As Vetian countries start to explore and colonize distant parts of the world during the Ninth Age, they come into frontal collision with the Saurian Ancients of Virentia, Taphria and southeastern Augea. Getting better! Torso slightly short compared to limbs for me. Thanks! He's meant to be hunching over, but the torso is still too short, I believe. Never had a strong eye measurement (proportions and so on).